Margaret Thatcher, the so called “Iron Lady,” resigned as British Tory prime minister on November 22, 1990. She had been in power for eleven years, winning three general elections, and yet was forced out before her term was over. Thatcher’s government was defeated by a mass movement of civil disobedience which included up to 18 million people – a huge proportion of the British adult population – defying the law. What’s more, that mass movement was led by a relatively small group called Militant, now the Socialist Party, which Socialist Alternative is in political solidarity with. The historic Poll Tax campaign showed the vital role that socialists can play in putting forward strategy and tactics to win. It also showed that a determined mass movement can defeat specific government policies and seemingly powerful right wing leaders can be driven out of office altogether. Learning the lessons of this struggle can give a powerful example to other movements today, such as those opposing Trump in the U.S.
Thatcher had been credited as having defeated the less hard-line Tory “wets” in her own party, the Argentinian dictatorship in the Falklands war, and the trade unions – particularly their most militant wing, the miners. She massively accelerated the advance of right-wing “neoliberal” economics – privatizing and cutting public services – which has been followed by every stripe of government since. The poll tax was a regressive local government tax imposed on every person 18 years and over, which meant rich individuals could pay the same amount or even less than the poor. It replaced the previous multi-tiered system based on the value of your home – and therefore the cost to working-class people was massively hiked. It was levied on the unemployed, students, and those with no personal income at all, who had been exempt from the poll tax’s precursor. It was not specifically a tax on voter registration, but councils could check the voter lists to track down those who hadn’t registered to pay. As such, it resulted in millions of the poorest dropping off the voter register. Because of Militant’s working-class roots, its finger on the pulse of the mood, and its analysis of the situation, we predicted that this issue would come to symbolize everything that the Tories were hated for. De-industrialization and deregulation had resulted in a huge increase in inequality and anger. Because the poll tax attacked everyone at the same time, millions of working-class and middle-class people would realize that on this issue we could win! It was not the willingness of workers to fight against Thatcher’s policies that had been lacking: it was the incapacity of the pro-capitalist leaders of the Trade Union Confederation (TUC) and the Labour Party to fight with the same determination as Thatcher. TUC leaders had refused for example to take action in support of the miners during their year-long bitter struggle in 1984/85. In the struggle of Liverpool Labour Council in 1985/86, led by the ideas put forward by Militant, Thatcher was taken on in a massive battle over cuts in national funding to the local council. That council created jobs, built more council homes than the rest of the country put together, and won many other gains for the people of Liverpool. The Militant councilors didn’t simply rely on their elected positions to get legislation passed on behalf of the masses. They used their elected office as a platform to mobilize mass struggles of the working class, including multiple citywide public sector strikes. This forced the government to retreat in the first year of the battle. And this use of elected positions as a platform for struggle was repeated in the poll tax battle. But the dire role played by so many trade union and Labour Party leaders, and the surrender of local Labour councils across the country that were not led by the same ideas as Liverpool, ultimately allowed the disqualification of Liverpool’s councilors from office. The Labour Party shut down its Liverpool district and began a huge witch-hunt on Militant supporters. This retreat on a national scale gave Thatcher the confidence to take on local government once more with the poll tax, introduced in Scotland in 1989 and England and Wales in 1990. At this stage, the Labour Party, although it always had pro-capitalist leaders, still had a working class base. Its history differs from, for example the U.S. Democratic Party, which began as a party of the slave-owners and has been a party of big business since the end of the Civil War. Labour was established at the beginning of the 20th century, its main driving force being the trade unions with millions of affiliated members, who also overwhelmingly provided its funding. Labour had, under pressure from below, introduced historic progressive reforms in the post-war government such as the National Health Service, the welfare state, and nationalization of a number of key industries (although on a bureaucratic basis). It had the allegiance of the majority of the most politically conscious workers. We described its character as that of a “bourgeois workers’ party,” a party with leaders loyal to big business and capitalism at the top, but with a working class base. However, the nature of the Labour Party was changing. From the expulsions of some of the leading Militant supporters in the mid 1980s onward the right wing was on the offensive. During the changes in the world situation at the end of the 1980s and 1990s a profound transformation took place which resulted in the ending of the real influence of workers in its structures and a thorough adoption of capitalism. It had become far more of a “bourgeois party.” Many of the activists in the poll tax campaign became hostile to the role the Labour Party was playing and turned away from it. Militant decided in the early 1990s to take an “open turn,” initially in Scotland and eventually in England and Wales leading to the eventual establishment of the Socialist Party in England and Wales and Socialist Party Scotland. However, the fighting socialist leadership of Militant supporters inside the Labour Party in the 1980s had successfully built key bases of support – including many councilors, three Members of Parliament, and the support of the party’s very active youth section. Militant advocated a strategy of mass non-payment of the poll tax. We helped build thousands of community based anti-poll tax unions in cities and towns across the country. These were linked nationally into the Anti-Poll Tax Federation, led by Militant supporters. This strategy struck a chord, but was not supported by many other political groups. The trade union leaders and the Labour Party leadership opposed the tax verbally, but did nothing to fight it, while actively opposing the non-payment campaign. Their strategy, to the extent they had one, was to get a Labour government elected that would eventually reverse the tax. In the meantime, Labour councils collaborated with Thatcher’s reactionary government by sending bailiffs into working class people’s homes to impound their property and jailed people for not being able to pay. And internally, refusing to pay the tax could get you expelled from the Labour Party. The prominence of Militant MPs Dave Nellist and Terry Fields in the poll tax non-payment movement was part of the reason for their expulsion. The tax was introduced in Scotland a year earlier than in England and Wales; perhaps because the Tories (the Conservative Party) had so little support there, they felt free to experiment! But it ignited Scottish workers’ anger and the method of mass non-payment was tested out. Militant supporters had to argue against those who said mass non-payment wouldn’t work, or would only get working class people in debt. Groups like the UK Socialist Workers Party (SWP) initially argued that mass non-payment was irrelevant and that it would need general strike action by the Trade Unions to win. Of course we wanted to link trade union action to the mass non-payment campaign, but the failure of trade union leaders to fight meant that trade unionists in the workplaces did not feel confident to take action. In that instance it would be wrong to abandon the chance of building a mass movement by other means and merely advocate an empty slogan at that point of “general strike.” We did everything we could to win the support of trade unionists and build anti poll tax groups inside workplaces. The SWP’s mistake led to some of their members paying their poll tax in Scotland before the party realized a movement had developed! Some advocated non-payment only for a few prominent individuals who “could afford it,” using the slogan “Can pay, won’t pay!” In reality this was a strategy for individual heroes or individual capitulation. On the contrary, only a mass movement would work. In fact millions would not be able to afford it and we planned to unite the “can’t payers” with the “won’t payers.” That way an organized campaign could defend people. Mass demonstrations developed around the rate-setting council meetings. 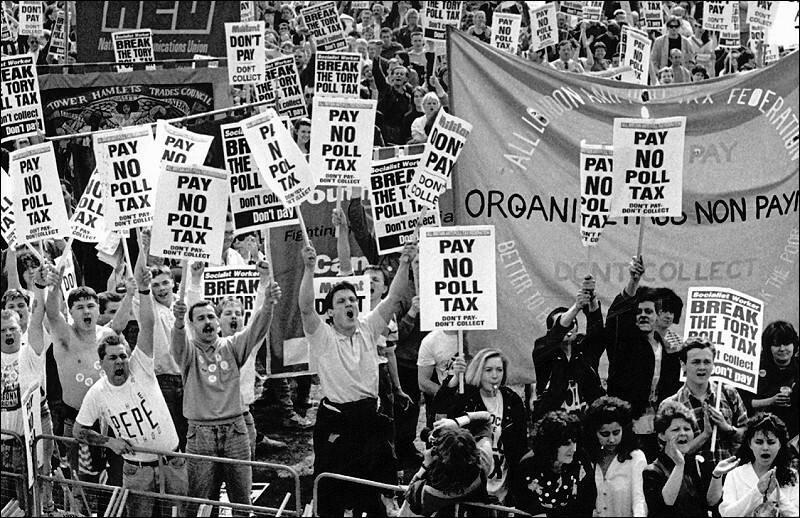 On March 31, 1990, the day before the poll tax was introduced in England and Wales, simultaneous mass demonstrations in London and Glasgow involved a quarter of a million people. In reality it was largely a police riot, provoked deliberately to portray the movement as “violent.” Some small groups saw rioting as a political act. Yet it was not these methods that kept up a sustained and ultimately victorious mass struggle with the poll tax. Demonstrations were important in bringing people together in action, but organised mass non-payment was the real reason for its demise. We kept the confidence of the movement up by discussing and answering every question at every stage, in meetings of hundreds in local neighborhood action committees, and in millions of leaflets. We clogged up the courts by mobilizing non-payers to attend their hearings and assisted people by asking questions in court. The court system was unable to cope with the scale of it. We skilfully utilized more than one method, using courtroom tactics as a way of supplementing the mass movement. We mobilized to stop the sheriff’s officers (Scotland) or bailiffs (England) from seizing property, sometimes involving mass demonstrations to blockade houses or whole streets. We also disseminated mass information on the limits of their powers especially in England. We also organised to stop poll tax jailings – the ultimate sanction. Hundreds were sent to prison, including many Militant supporters. The late Terry Fields, a Liverpool MP and Militant member, was sent down for standing in solidarity with his constituents. However, the number of jailings, a few hundred compared to the millions who refused to pay, was far fewer than it would have been if there was no organised campaign. Without that, many more of the poorest would have gone to jail unnoticed. The government announced in March 1991 that they would be scrapping the tax by 1993. We continued to campaign and argued for the writing off of the debts. Many debts were actually secretly dropped by councils at a later date. Thatcher was replaced as Tory leader and prime minister by John Major. Yet despite everything that had happened in this historic blow to Thatcher’s party, in the following general election in 1992 the Labour leader Neil Kinnock failed to defeat the Tories. This was a consequence of the failure of Labour to fight against the Tories’ attacks, including its decision to denounce rather than champion the anti-poll tax struggle. With this failure, Labour managed to get seven million fewer votes than the number of people who had refused to pay the poll tax! Winning their support alone would have been enough to win the election. The lack of a mass working-class party that could absorb the lessons of this struggle meant that although a decisive victory was won on the issue, the political party of Thatcher remained in power. In fact in later years when Labour finally came to power again under Tony Blair, it was with the continued legacy of Thatcher’s policies – privatization, cuts to services, attacks on workers’ living standards and of course support for imperialist wars. However, millions had learned the lesson that if they unite in a determined movement they could win. The powerful poll tax movement in Britain should give today’s activists confidence that we can also defeat Trump’s reactionary agenda in the U.S. today, as well the present Tory government in Britain. It shows how a movement with a socialist backbone can, with clear tactics, strategy and analysis, can defeat the forces of reaction. Britain: Seven Blairite MPs Split from Labour Party – Now Kick Out the Rest!